The stunning Strade Bianche race took place in the rolling hills and on the gravel roads of Tuscany today, where an unlikely Italian stole the win on home turf. A perfectly timed attack from talented youngster Moreno Moser saw him hold off the peloton, with his teammate Peter Sagan coming across the line in second place, capping a Cannondale one-two. Key to how the race played out was the composition of the day’s main breakaway and the lead they were able to build up. Four riders, Aleksejs Saramotins (IAM), Maxim Belkov (Katusha), Giairo Ermeti (Androni Giocattoli) and Michael Schar (BMC) were allowed to escape, and at one point had an advantage over the peloton of over nine minutes. With over 50km to go, and with the peloton seemingly reeling the escapees in comfortably, Vacansoleil’s Classics man Juan Antonio Flecha took an interesting decision and attacked off the front. However, it seemed like he’d left himself too much work to do when he still had a couple of minutes to close down with 20km remaining. Instead, he was just left dangling between the break and the bunch, serving as much of a purpose advertising his team’s title sponsor’s camping holidays as contesting the victory. Astana and Vini-Fantini took up the chase before, with around 17km to go, a solo move came from the 22-year old Trentini Moreno Moser (Cannondale), who only turned professional last season. He dropped Flecha as quickly as he’d bridged the gap, before setting about capturing the race leaders. 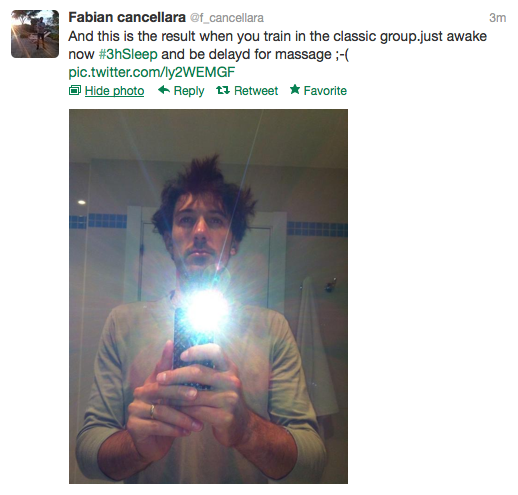 While doing so there was some agitation amongst the favourites in the peloton, with Fabian Cancellara (RadioShack Leopard) and Peter Sagan (Cannondale) twitching behind. They weren’t allowed to get a gap. With 6km to go Moser and the dropped Saramotins hit the front of the race, rejoining the two leaders Belkov and Schar, with Ermiti now chucked out of the back. Meanwhile back down the road a strong second group had got some time, featuring Tom Jelte Slagter (Blanco), Rinaldo Nocentini (Ag2r La Mondiale), Giampaolo Caruso (Katusha) and Andrey Amador (Movistar). However, that move didn’t stick, and soon enough things came back together in the group behind. After some initial hesitation as the race came into the stunning surroundings of Siena, Moser stopped glancing behind at the remnants of the peloton and attacked. Soon enough, he was all alone going up the final ramp. Despite his burning legs he managed to make the move stick, coming across the line with a five-second advantage over teammate Sagan, with Nocentini third. 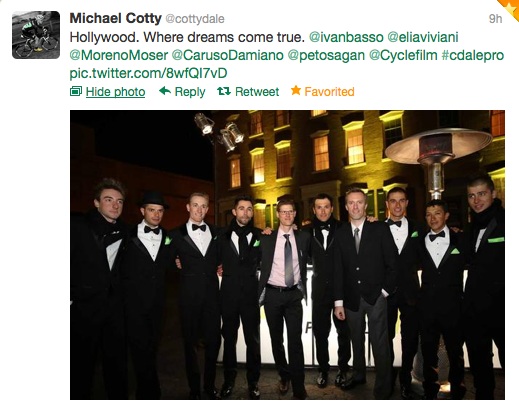 The victory was an exercise in great strategy from Moser and Cannondale. 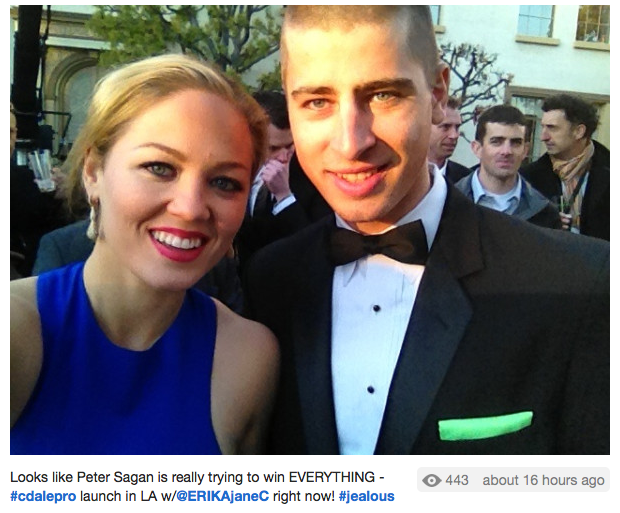 After the race, Moser stated that he “used Peter for the win,” and it’s certainly true that Sagan played a crucial role in his teammate’s win, without ever actively contributing. While this may seem odd, it all comes down to the early break and the riders present. BMC brought a strong team to this race, with Greg Van Avermaet and Cadel Evans both possible winners. Therefore, placing their man Michael Schar in the early break put the onus on other teams to do the chasing, while they preserved their energy for a late surge. They were the key team, who would have a vital role in determining how the race played out. By contrast, RadioShack and Cannondale weren’t as strong, and weren’t really in a position to chase a break down. 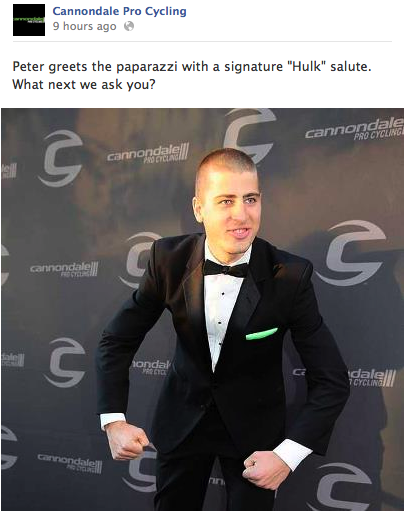 However, where Cannondale had the key advantage was that they had both Moser and Sagan capable of winning, rather than just one rider. With Sagan a race favourite, he was always going to be a marked man – and this was demonstrated in how he was constantly riding alongside fellow hopeful Fabian Cancellara throughout the day. This allowed his teammate Moser, to slip off the front quietly with a perfectly timed attack, while the focus was on Sagan’s jousting with Cancellara behind. With BMC not chasing because Schar was still out in the lead group, RadioShack not able to chase with a one-man team and Cannondale not willing to do so with Moser out front, the peloton’s work was left up to Astana and Vini Fantini in the closing kilometres. The big players were simply not involved. This, ultimately, bought Moser the crucial five seconds which saw him take victory, in an excellent one-two for Cannondale. Something tells me he won’t be able to escape as easily next time. Over the last several seasons we’ve seen more and more teams creating videos that introduce the new team at the beginning of the season. Some are polished and others are well… less polished, but they are all fun to watch. 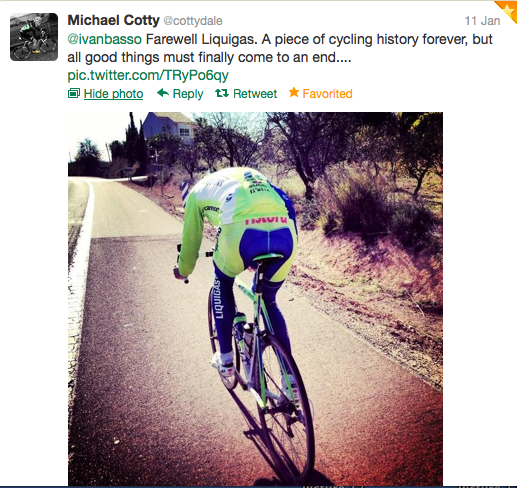 This page contains all the videos we’ve found this year for WorldTour teams. Bookmark it or share it with your friends and let us know if you’ve found some that we haven’t and we’ll add them! I’m not sure this is strictly an introduction video. I think this is the French version of Call Me Maybe but just not as popular. 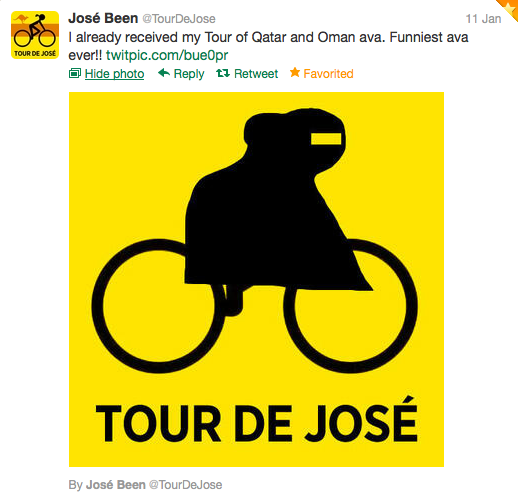 Remember to do the ‘hand tweet’ every time you see an Ag2r rider. It’s been a busy old week for our boys in the peloton – teams were finishing up their training camps, unveiling new kit, getting their team pics and packing up to go Down Under for a tour. Let’s start with a premiere. 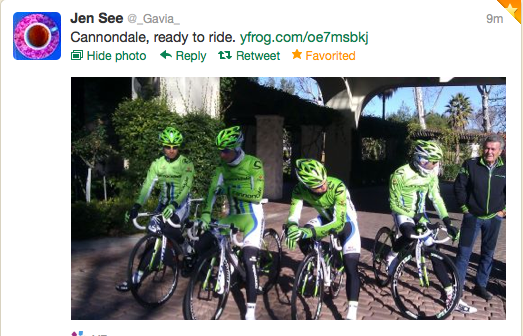 Here is the new kit, the new name, the new bikes. 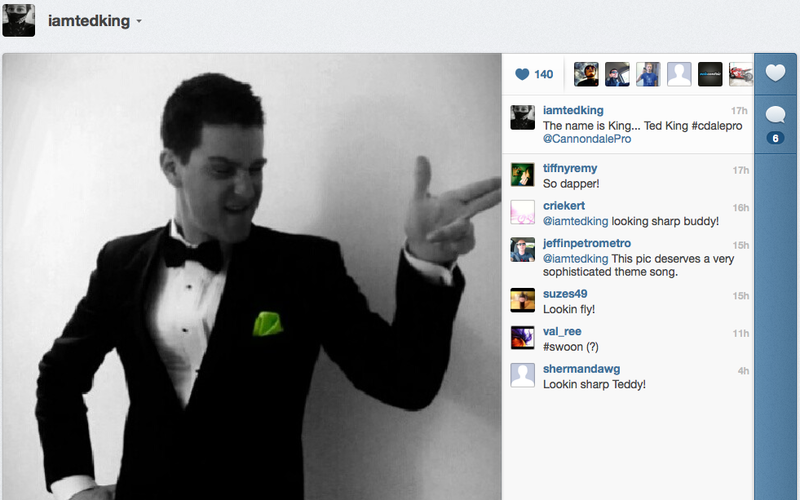 But what do the boys look like in tuxedos, hobnobbing it on the red carpet? Funny you should ask. But here is the team together and looking dapper. I do like the lurid green pocket kerchiefs. Nice touch. 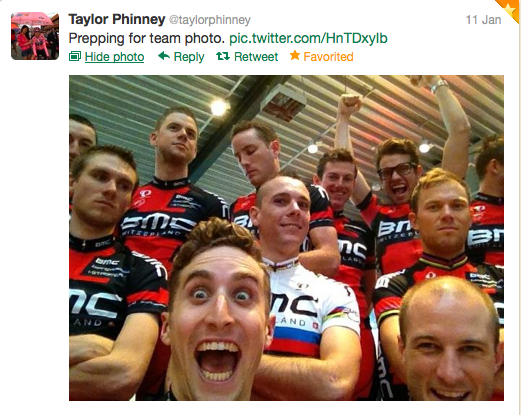 Leave it to Hollywood Phinney to post up a picture of prepping for a picture. PhilGil looks amused, Thor most resolutely does not, there are some bored faces, a couple of guys clowning around … just like school pictures, isn’t it! 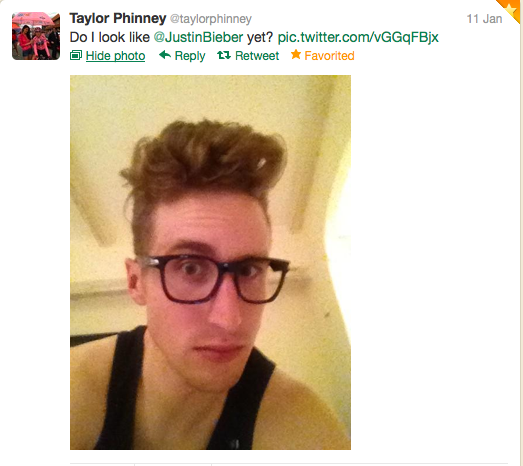 I’m not sure why Mr Phinney is fixated on how Bieberesque he looks from week to week but I’m liking the nerd glasses on him. From the picture above and the picture below, we can safely say the boy ain’t vain! Remember last year in May? #GiroLoveStory? Taylor seems to be looking for love again – but it kind of backfired on him when he went onto Snapchat. But as they say in Seinfeld, “Not that there’s anything wrong with that!” Our young hero has found happiness elsewhere, however. Dude! What happened to your hair? There was a vicious rumour going around the Twittersphere AND the Daily Mail last week that Bradley Wiggins was going to record a song with a reformed Jam. As Weller and Wiggins pretty much have the exact same hairdo and they seem to be connected at the hip of late, it seemed plausible. Plus, you know, Paul hasn’t been up to much lately, this might have been a way to get in the charts again. But NO! There was a short sharp retort from Weller HQ. 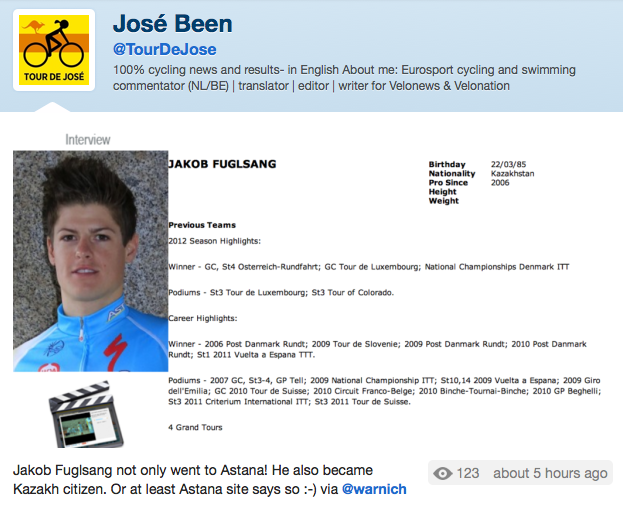 Boy, Jakob Fuglsang really throws himself into his new team. Jose Been always changes her avatar according to the race that’s on … as you can see in the left hand corner, she’s being chased by a tiny flying kangaroo. So once she gets caught by the ‘roo, she turns into ET. 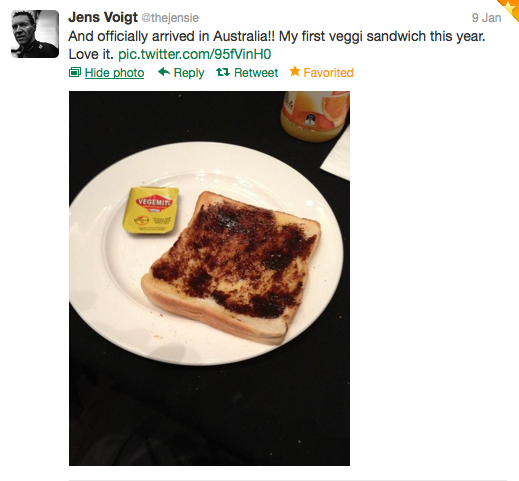 Ah, getting through the airport … Jens seemed to be with Lotto-Belisol’s Marcel Sieberg when they were going through Aussie immigration. Could you imagine that happening with UK or US immigration? No, I can’t either. 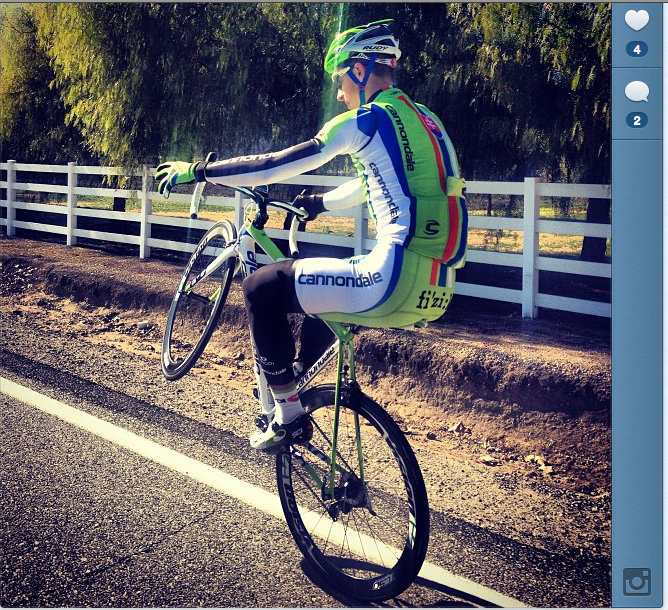 I wonder what Mark Renshaw is going to be doing in the TDU – hopefully not riding in the wind. I like that he made it a little story, though. And we leave on a life-affirming note. 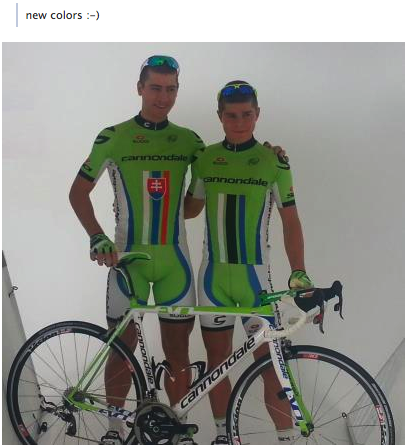 Niki Terpstra is a father. Congratulations! A method to my madness? So until next time, tweeties, have a good one!